Spice Island Beach Resort in Grenada , has extended its Valentine’s Day offer, which includes the seventh night free with weeklong bookings made through Jan. 31, 2014 for travel between May 1 – Oct.
Spice Island Beach Resort in Grenada (www.SpiceIslandBeachResort.com), the #1 rated resort in the Caribbean based on TripAdvisor reviews, has extended its Valentine’s Day offer, which includes the seventh night free with weeklong bookings made through Jan. 31, 2014 for travel between May 1 – Oct. 31, 2014. Couples can bask in their love over dinner for two on the world-renowned Grand Anse Beach, enjoy a complimentary couples massage and a romantic sunset cruise. Tucked away on pristine shorelines just 10 minutes from the airport, Spice Island Beach Resort is surrounded by immaculate tropical gardens and offers a world-class spa featuring treatments using local herbs and spices. The resort also offers an unmatched culinary program serving seven-course dinners ranging from diet-friendly to decadent. 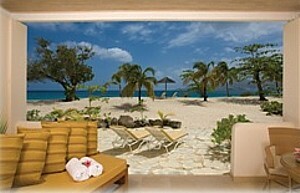 Spice Island Beach Resort offers several suite categories including garden, beachfront and private pool suites. All suites are air conditioned and outfitted with spectacular five-star amenities including a large whirlpool, LCD flat panel televisions with cable, dvd player and iPod docking station, the softest Italian Frette bathrobes and linen, Molton Brown bath and body amenities, mini-bar, CD player/clock radio, iron, ironing board, hairdryer, direct dial telephone with Internet access, safe, coffee/tea facility, toaster, chaise lounges and patio or balcony. Several suites feature a private pool. The resort recently completed a multi-million dollar renovation project which included a redesigned courtyard, reception area, residence lounge, restaurants and guest rooms, in addition to an extensive upgrade and expansion to the property’s full-service Janissa’s Spa. Spice Island Beach Resort is a member of the esteemed Small Luxury Hotels of the World (SLH) collection and the first and only resort in Grenada to be featured in the exclusive Virtuoso network’s Hotels & Resorts Program and Signature Hotels & Resorts Collection. Click on http://www.spiceislandbeachresort.com/imagelibrary for pictures of the property. Visit http://www.spicebeachresort.com/VirtualTours.htm for a virtual tour. Grenada’s luxurious Spice Island Beach Resort (www.SpiceIslandBeachResort.com),s consistently recognized as a top destination for travelers around the world, was just named one of 10 “Best All-Inclusive Resorts” in Fodor’s 100 Top Hotel Awards. The resort also received the 2013 Condé Nast Johansens award for “Most Excellent Service” and distinction as the #1 property in Virgin Holidays’ exclusive Platinum Collection. The Fodor’s 100 Top Hotel Awards are chosen by Fodor’s editorial team, in conjunction with the outlet’s seven hundred writers from around the world, who live and work in the destinations they cover. What makes the Fodor’s 100 different from other hotel awards is that no hotel or resort can nominate themselves. The chosen 100 properties represent the best in class in nine categories. Tucked away on spectacular Grand Anse Beach, just 10 minutes from the airport, Spice Island Beach Resort has also achieved “Gold”standing in Condé Nast Traveler’s 2011 and 2012 Readers’ Choice Awards, as well as at the Virgin Holidays Awards, where the resort was ranked #1 in the tour operator’s Platinum Collection from 2006-2012. The resort is also the recipient of the coveted AAA Four Diamond® Award, which it received for the last eight consecutive years. Spice Island Beach Resort is surrounded by pristine tropical gardens and offers a world-class spa and culinary program, and a wide choice of elegant beachfront suites situated right on the beach at the edge of the Caribbean Sea. Offering a new spin on beachfront elegance, Spice Island Beach Resort’s signature Seagrape Suites are equipped with a luxurious large whirlpool tub with views of the ocean and separate shower featuring chic, new Hansgrohe fixtures designed by Phillip Starck. An additional 225 sq ft. of spacious patio with private garden, chaise lounges and a double hammock provide the perfect romantic setting to absorb the breathtaking Caribbean sunset. For the discerning couple, Spice Island Beach Resort’s custom-designed Royal Collection Pool Suites and Luxury Almond Pool Suites offer an oasis of private luxury. Each suite is at least 1,500 sq. feet with its own private entrance and tropical garden as well as a residential size swimming pool and outdoor dining terrace. The spacious bedroom is decorated in contemporary Caribbean style and features a luxurious canopy bed, making it an ideal setting for the perfect romantic retreat. An elegantly furnished bathroom with a whirlpool tub adds a touch of Caribbean romance. The Royal Collection Pool Suites also feature a Cedar Sauna. All suites are air conditioned and outfitted with spectacular five-star amenities including a large whirlpool, LCD flat panel televisions with cable, dvd player and iPod docking station, the softest and smoothest Italian Frette bathrobes and linen, Molton Brown bath and body amenities, mini-bar, CD player/clock radio, iron, ironing board, hairdryer, direct dial telephone with Internet access, safe, coffee/tea facility, toaster, chaise lounges and patio or balcony. Several suites feature a private pool. Spice Island Beach Resort features 64 elegantly-appointed suites, the full-service Janissa’s Spa, a Cybex® fitness center, Oliver’s beachside gourmet restaurant, the Sea & Surf Terrace for light lunches, the Sea & Surf Bar for refreshing cocktails throughout the day, a central swimming pool with swim-up whirlpool, an Omnicourt® tennis court, the Nutmeg Pod children’s activity center, the Gatsby Boutique and more. Spice Island Beach Resort is a proud member of the esteemed Small Luxury Hotels of the World (SLH) collection and the first and only resort in Grenada to be featured in the exclusive Virtuoso network’s Hotels & Resorts Programme and Signature Hotels & Resorts Collection. For more information, contact Spice Island Beach Resort at tel: 1-800-501-8603, fax: 1-473-444-4807, e-mail: reservations@spicebeachresort.com, or visit www.SpiceIslandBeachResort.com.